It is fitting that the centennial milestone of the man who opened the world’s eyes to the wonders of ocean life and helped us to breathe underwater will be marked with year-long festivities that include the re-launch of his beloved ship, Calypso. The ship that inventor, ecologist, researcher, author and much-awarded filmmaker Jacques-Yves Cousteau spent much of his life aboard to give us our first glimpses of deep-sea life is being refurbished and will sail again to maintain his legacy. “People protect what they love.” That aphorism voiced by le Commandant Cousteau was his life’s work and purpose. Born on the 11 June 1910 it would take another 26 years before Cousteau would fall in love with the sea. It happened when his friend Philippe Tailliez lent Cousteau a pair of underwater goggles to look at marine life. Cousteau would often talk of “making love to the sea.” ''I loved touching water,'' he once wrote. ''Physically. Sensually. Water fascinated me.'' Water, the oceans and all they contained would prove a life-long love affair for Cousteau that would serve humanity well. Cousteau’s work and legacy is the product of his wanting to make humanity fall in love with the sea, just as he did on that sunny Sunday morning in Toulouse. To achieve his goal, Cousteau created over 120 television works which he refused to call documentaries, but instead called “adventure films”. He wrote and co-authored more than 50 books including his first “The Silent World” which by the time of his death on 25 June 1997 had sold more than 5 million copies in 22 languages. But Cousteau’s influence stretches way beyond getting the world to fall in love with the oceans and fiercely championing marine conservation. Instantly recognisable by his gaunt silhouette and red knitted cap, Captain Cousteau helped invent the aqualung (better known by its acronym self-contained underwater breathing apparatus or scuba) when he was 33. This was arguably one of the most significant inventions of the 20th century enabling man to explore under water for extended periods and opened a window to a whole new world that had until then been mostly undiscovered by mankind. Other Cousteau inventions include underwater cameras, filters, lenses and lighting techniques that enabled his film-making and allowed people to see the underwater world in his “adventure films”. He founded two organisations dedicated to the protection of ocean life - the Cousteau Society and its French counterpart, l’Equipe Cousteau. “If he were alive today, my father would surely be awed by the technology and skill behind the work of his cinematic successors, who share my father’s philosophy that ‘people protect what they love – and we love what enchants us’,” said the legend’s son, Pierre-Yves Cousteau, himself an oceanographer of world renown. “He would be gratified by the creation of marine protected areas in many countries and by the growing community of scientists working to advance understanding and conservation of ocean biodiversity, such as those completing the first Census of Marine Life and its inventory of ocean species. “However, I know he would also be distressed by the ongoing pillaging of oceans by industrialized fisheries, by those who decimate the seabed and indiscriminately harvest fish and by-catch by the shipload, by the catastrophes that stem from exploiting off-shore oil resources, and by the acidification of seawater due to greenhouse gases, which threatens the health of all life on Earth. “In this year, the 100th anniversary of his birth, we owe it to his memory to ensure that the spirit of Jacques-Yves Cousteau and his work inspire new generations,” says Pierre-Yves. To continue Captain Cousteau’s legacy the Cousteau Society and l’Equipe Cousteau led by his widow Francine are refurbishing the Calypso as a touring educational exhibition. Sunk and badly damaged when a barge accidentally rammed into it one year before Cousteau’s death, Calypso’s upgrade will include Cousteau-designed one- and two-person mini-submarines, underwater scooters, aqualungs, diving suits, cameras and other equipment used during Cousteau’s filming expeditions which won him numerous Oscars, Cannes’ Palme d’Or and Emmys. 1019 charts (Edition 05/29/2010) have been updated in the Marine GeoGarage. Summer Sailstice is a global holiday celebrating sailing held annually on the Saturday closest to the summer solstice, the longest sailing days of the year. Its easy to participate in Summer Sailstice and its free! Summer Sailstice participants simply register, go sailing and automatically become eligible to win one of over 400 prizes from our supporters, from a yacht charter with The Moorings to sailing gear from your favorite marine suppliers. Just sign up here to join the thousands of sailors around the world planning to sail on June19th! Visit Sailstice Tales to see stories of Sailstice events from around the world in 2009. Our online community at SummerSailstice.com allows you to quickly find others to join your crew for a raft up at a favorite sailing destination or create a sailboat party out on the water to celebrate the beginning of the summer sailing season ahead. No rules, no fees, no start time and no excuses not to go out and have fun! If you like to relax in the sailing lifestyle, compete in the sport of sailing or cruise the seven seas , Summer Sailstice applauds your desire to be out on the water under sail! Summer Sailstice was founded in February 2001 by John Arndt, as the global, annual celebration of sailing held on the summer solstice. The annual Summer Sailstice sailing event is free to all participants and has grown from 200 boats signed up in 2001 to well over 2,000 boats today. Since many sailors join in the fun on boats signing up, the actual number of Summer Sailstice sailors participating is estimated at almost 10,000 annually. Spread the word about Summer Sailstice by inviting your friends. Sailors for the Sea is a nonprofit organization that educates and empowers the boating community to protect and restore our oceans and coastal waters. BlooSee : join the Summer Sailstice BlooSee group and share your sailing plans, comments and photos (Bloosee is a sea-lovers community where you can share geolocated information -infopoints or POI- about the ocean). After years of growing concern about the effects of marine noise on whales, scientists are finally asking what noise could do to fish. Whether they’re harmed isn’t yet known, but it’s certainly a possibility. The oceans are an increasingly clamorous place, with boat motors and sonar and explosions and construction creating a din at frequencies used by fish. 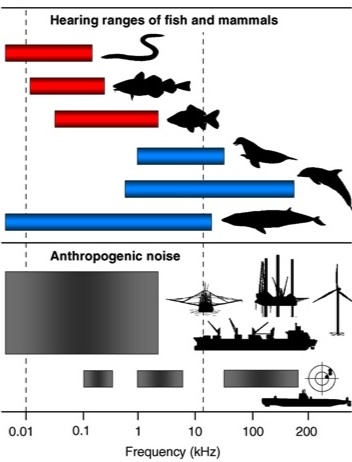 Popper co-authored a review of the field’s patchy, question-filled literature in the June Trends in Ecology and Evolution, marking a shift in thinking about ocean noise. Until recently, researchers and environmentalists who thought at all about aquatic noise were focused on marine mammals and especially whales, which can be debilitated by sonar and engine noise. But the world’s 21,000 fish species also rely on sound. Many use it to communicate, and almost all rely on acoustics to navigate a dark, often turbid world. What Jacques Cousteau called “The Silent World” is actually full of natural noise, from fish calls to the sound of their bodies moving through water. To that natural din, human activity has added roughly 10 decibels of ambient commotion in the last half-century. At construction sites for offshore oil platforms, wind farms and river bridges, where explosions and pile drivers can hit 250 decibels repeatedly for months or years on end, the noise is even more intense. All this has concerned researchers like Popper, who warn that scientists simply don’t know how fish respond. Studies on the effects of noise in terrestrial animals may provide some guide for what’s happening to fish. In some bird species, traffic noise that overlaps with song frequencies has been linked to drops in population diversity and density, and seems to reduce reproductive rates. The same appears to happen with frogs. Those findings don’t necessarily apply directly to fish, but they’re suggestive. As for the fish themselves, studies are mixed. Tuna appear disoriented by boat noise, while some reef fish stay in their homes during and after massive air gun blasts. In some species, ship noise seems to increase production of cortisol — a stress hormone with damaging long-term effects — and harm eggs and larva. Another study, however, found no evidence of harm. “If fish are swimming up the Potomac, and get to a construction site for the Woodrow Wilson bridge, do they go around it? Swim back to where they come from? Stop? This is a question for all of us,” said Popper. Research is hindered by the different qualities of various types of underwater noise noise, as well as the variability of fish species, he said. It’s also hard to study fish behavior. “The best method would be to put transmitters in the fish, have receivers all over the place, and keep track of every fish” in a specific area, said Popper. Nobody has yet accomplished such a complicated task, though that’s a result not just of technical difficulties, but lagging scientific curiosity. “The first thing we need to appreciate is that sound is extremely important to the lives of fish,” McCauley said. Image: 1) Test tank of fish exposed to high-intensity sonar./Arthur Popper. 2) Graph of frequencies used by marine animals and generated by human activity./Trends in Ecology & Evolution. Citation: “A noisy spring: the impact of globally rising underwater sound levels on ﬁsh.” By Hans Slabbekoorn, Niels Bouton, Ilse van Opzeeland, Aukje Coers, Carel ten Cate, and Arthur N. Popper. Trends in Ecology & Evolution, Vol. 25 Issue 6, June 2010. World Oceans Day, June 8, arrives this year at a time when people are especially focused on the safety of waters threatened by the Gulf oil disaster. Yet it is also a time when more people are committing to work to preserve the oceans than ever before. Among them is Roz Savage, who last week completed the third and final leg of her effort to row across the Pacific Ocean. Savage was one of dozens who took part in the Mission Blue cruise in April, organized by the nonprofit group TED to develop a strategy to save the oceans. The Mission Blue Voyage was a product of undersea explorer Sylvia Earle's 2009 TED Prize wish "to ignite public support for a global network of Marine Protected Areas, hope spots large enough ... to restore the blue heart of the planet." The Galapagos cruise attracted leading scientists and celebrities and resulted in $15 million in pledges to protect the seas and advocate for new policies. She wound up competing in the Atlantic Ocean rowing race, from the Canary Islands to Antigua, a 3,000-mile run." Sure, I had wanted to get outside of my comfort zone, but what I'd sort of failed to notice was that getting out of your comfort zone is, by definition, extremely uncomfortable. And my timing was not great either -- 2005, when I did the Atlantic, was the year of Hurricane Katrina. There were more tropical storms in the North Atlantic than ever before, since records began. And pretty early on those storms started making their presence known." In her talk making the wish, Earle pointed out that in the past 50 years, 90 percent of the big fish in the oceans have been consumed and nearly half of the ocean's coral reefs have disappeared. Less than 1 percent of the ocean is protected from destructive fishing, and Earle believes the seas will go into irreversible decline unless a much larger portion -- some experts say as much as 30 percent -- is protected. Earle said the world needs to act swiftly to protect what she calls "the blue heart of the planet that basically keeps us alive." She managed to meet up with the crew of the "Junk Raft", a boat made mostly of plastic water bottles that Savage said was built to call attention to "the North Pacific garbage patch, that area in the North Pacific about twice the size of Texas, with an estimated 3.5 million tons of trash in it, circulating at the center of that North Pacific Gyre." If I can row 8,000 miles to make a point about the state of our oceans, then you can do your part too. Start by going to http://ecoheroes.me and log a single green deed that you are going to do today, Oceans Day, to help save our seas. We have a lot of work to do, but the longest journey starts with a single step -- or oarstroke. Sailing ships could effectively harvest energy from the wind blowing over the vast tracts of ocean too far from the shore for wind turbines, claimed a scheme unveiled last month, according to a story being reported from London. The ships would turn wind power into hydrogen, which would be stored on board, to be unloaded later and will eventually be used to generate electricity, according to the Asian News Service. The idea is the brainchild of Max Platzer and Nesrin Sarigul-Klijn at UC Davis. "Our proposal makes ocean wind energy available for exploitation -- a huge energy reservoir because the oceans cover 70 per cent of the globe," New Scientist quoted Platzer as saying. It "offers the opportunity to make a decisive contribution to the solution of the energy and climate crisis," he added. The ships would tow hydropower generators consisting of two wing-like underwater blades that would be made to oscillate by the force of the water as they plough through it. This motion would turn a crankshaft connected to a generator. The electricity this produces could then be used to split seawater into hydrogen and oxygen. Sailing ships can reach speeds of up to 25 knots (46 kilometres per hour). A ship with 400 square metres of sail, operating in a moderate force 4 breeze of 15 metres per second, could generate up to 100 kilowatts of electrical power, Platzer and Sarigul-Klijn calculate. They also say it should be possible to build larger ships capable of generating up to 1 megawatt. With enough ships, the energy needs for the entire planet could be met this way, said Platzer. "Obviously, this is a roundabout way of generating electricity instead of converting wind or water flow energy directly into electricity using stationary windmills or hydroturbines," said Platzer. This will clearly lead to some losses, but he calculates that the electricity can be converted into hydrogen and back again with about 30 per cent efficiency. Concentrated energy. Extracting energy from flow of water rather than directly from air has advantages, as the power density is much higher. Platzer said that the water flow through the underwater generator has a power density of 36 kilowatts per square metre - far more than the 1.2 kilowatts per square metre typical of air blowing through a rotating wind turbine. The more concentrated energy means that the equipment needed to harvest it can be smaller. The researchers presented their paper at an American Society of Mechanical Engineers energy sustainability conference in Phoenix, Ariz.
Can GPS help your brain get lost? Increasing reliance on global positioning systems could damage our own internal sense of direction and have other unforeseen effects on the brain, neurological research suggests. As part of a larger article on the real and hypothesized effects of relying on computerized navigation systems on the mind, Alex Hutchinson in the Canadian magazine The Walrus looked at research on spatial cognition. one is a spatial strategy that involves learning the relationships between various landmarks — creating a cognitive map in your head, in other words, that shows where the flower shop and other destinations sit on the street grid. the other is a stimulus-response approach that encodes specific routes by memorizing a series of cues, as in: get off the bus when you see the glass skyscraper, then walk toward the big park. Those that prefer one method over the over is split evenly with half of the population using cognitive mapping, and the other half using stimulus-response. Another recent study by researchers from National Autonomous University of Mexico in Mexico City comparing routing methods by groups of men and women, found that women tend to use landmarking to remember the best routes. According to the scientists, the study's finding reinforces the idea that male and female navigational skills have evolved differently over time. The male strategy is the most useful for hunting down prey - a practice which has led modern man to navigate by creating a mental map, then imagining their positions on it. Women, however, are more likely to recall their routes by using landmarks if they are retracing paths to the most productive patches of plants. According to researchers, it all goes back to the Pleistocene epoch - which began more than 2.5m years ago - when humans' route finding skills were honed differently for the distinct tasks of hunters and gatherers. Luis Pacheco-Cobos, who led the research at the National Autonomous University of Mexico in Mexico City, said: "These findings show that women perform better and more readily adopt search strategies appropriate to a gathering lifestyle than men." Though the data can only be extrapolated so far, Jason Lerch’s mouse studies (research at the mouse imaging centre at Toronto’s Hospital for Sick Children) suggest that human brains begin to reorganize very quickly in response to the way we use them. The implications of this concern Bohbot. She fears that overreliance on GPS … will result in our using the spatial capabilities of the hippocampus less, and that it will in turn get smaller. Other studies have tied atrophy of the hippocampus to increased risk of dementia. The area of research that looks at the mind’s ability to map out geography, and the reverse effect of navigation experience on the development of the mind is relatively new. Cognitive maps are the way the brain forms a virtual representation of the environment and the term was introduced in 1948 by Edward Tolman. Giuseppe Iaria, an assistant professor in Cognitive Neuroscience at the University of Calgary and Jason Barton, a professor at the University of British Columbia, recently published their research on this newly named disorder in the journal Neuropsychologia. If you’ve always suspected that your cognitive mapping skills are shaky, you can take Isaria and Barton’s series of nine tests designed to assess your orientation skills. The entire test takes about ninety minutes and you are required to do the entire study in one sitting. If you complete the study and supply your email address, the researchers will email you a report on your test results. WashingtonPost : Are Google Maps and GPS bad for our brains ? At five metres above sea level, Tuvalu has one of the lowest maximum elevations in the world, making it extremely vulnerable to storms and changes in sea level. Many low-lying islands in the Pacific are growing in size to counter the effects of rising sea levels, according to new research. Scientists have feared that many of the small islands throughout the South Pacific will eventually disappear under rising sea levels caused by climate change. But two researchers who measured 27 islands where local sea levels have risen 4.8 inches over the past 60 years, found just four had diminished in size. The study found that the coral islands are able to respond to changes in weather patterns and climate, with coral debris eroded from encircling reefs pushed up onto the islands' coasts by winds and waves. Professor Paul Kench of Auckland University's environment school said that the study shows the islands are coping with sea-level change, with higher waves and water depth supplying sand and gravel from coral reefs. 'They're not all growing, they're changing. They've always changed ... but the consistency (with which) some of them have grown is a little surprising,' said. Tuvalu, a coral island group that climate change campaigners have repeatedly predicted will be drowned by rising seas, has its highest point just 14 feet above sea level. The research, which appeared in this week's New Scientist, found that seven of Tuvalu's nine islands had grown by more than 3 percent on average over the past 60 years. In 1972, Cyclone Bebe dumped 346 acres of sediment on the eastern reef of Tuvalu, increasing the area of Funafuti, the main island, by 10 percent. Another island, Funamanu, gained nearly 30 percent of its previous area. On World Environment Day in 2008, Kiribati President Anote Tong warned parts of his island nation were already being submerged, forcing some of Kiribati's 94,000 people living in shoreline village communities to be relocated from century-old sites. Worst case scenarios showed Kiribati would disappear into the sea within a century, he said at the time. But he warned an accelerated rate of sea-level rise could be 'the critical environmental threat to the small island nations,' with 'a very rapid rate of island destruction' possible from a water depth beyond a certain threshold. That threshold currently is unknown. 'Coral islands can keep up with some sea-level rise, but (there's also) ocean warming ... and ocean acidification ... that are certainly problematic for the corals. 'Sea-level rise can actually make the islands grow - as it apparently is doing,' said Hunter.